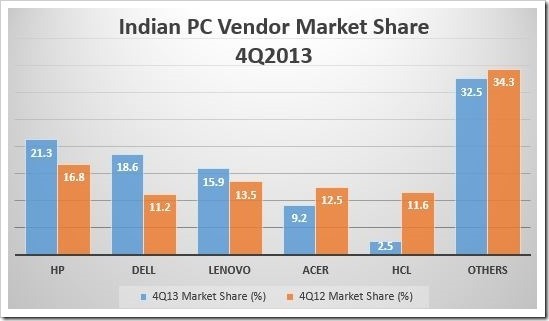 Last couple of years have not been good for consumer PC market worldwide. It is clear that rise of mobile devices and tablets have eroded their market share. According to Gartner’s latest report, PC market in saw a steep decline in last quarter of 2013 and fell as much as 19.9 percent compared to fourth quarter of 2012. While mobile PCs (laptops, notebooks) are doing relatively well, the PC market is diminishing at rather rapid pace. Mobile PCs registered a 27 percent year on year increase. Dell witnessed significant growth in their notebooks segment, which increased over 49 percent compared to last year. This growth primarily came from the consumer segment where Dell grew by 70 percent. And though HP was the largest by market share, their consumer segment growth was dismal 3 percent compared to previous quarter. HCL who announced closure of their PC business witnessed a significant fall from 11.6 percent in 4Q2012 to just 2.5 percent in 4Q2013. Acer also saw their market share falling by 3.3 percent to 9.2. Can Honor Repeat The Xiaomi Success Story In India? Xiaomi Tops Indian Market With A 31% Share; Netflix Now Available On Tata Sky!